The last non-Peronist president to finish his elected mandate was Marcelo T. de Alvear in 1928. Mr. Macri could break the spell. But it is far from certain that he will, and because he underestimated the magnitude of the problems he inherited from former President Cristina Kirchner, the case for smaller government now requires even bolder leadership. Twelve years of Kirchner rule—first Néstor Kirchner (2003-07), followed by his wife (2007-15)—left this country bankrupt, both institutionally and financially. The Kirchners jailed political opponents, confiscated private property, nationalized businesses, gagged media critics, fomented street mobs, falsified government statistics, and destroyed the central bank’s independence. Kirchnerismo bloated the government and left the economy in shambles. 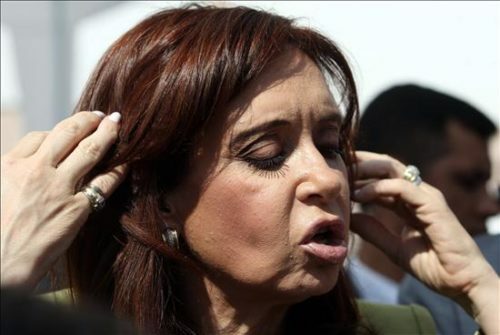 Cristina Kirchner plans to use upcoming negotiations with teachers’ unions to paralyze the country. It’s up to the Argentines to play along – or not. Linked to by The Other McCain. Thank you! The BBC calls them “phantom workers”; Argentines call them “gnocchi” or “noqui”. Nearly 200 phantom workers at Argentina’s parliament have been caught in a crackdown on employees who only show up sporadically for their jobs, it has been reported. Known as “gnocchi” or “noqui” in Argentina – after the popular dumpling dish that is traditionally served on the 29th of each month – it is a nickname given to state employees who do not perform real work, and only go to their official workplace once a month to claim their salary cheque. With the new system in place, La Nación notes that “the corridors of the legislature are flooded with employees, the nearby cafes are crowded and old faces that were not seen in the area for a long time can be seen”. The new biometric system requires employees to sign in with their fingerprint every day if they want to draw a salary, La Noticia1 reports. Of the 160 staff under investigation from the payroll of 16,500 persons, 83 had missed at least 10 days in a row at work without being able to justify themselves. Macri had already mass fired of 20,000 civil servants in January last year, a good start. double taxes on private airplanes and expensive boats and motorcycles. The government aims to cut corporate income taxes to 25% from 35% within five years, reduce social security taxes on employers and eliminate taxes on certain bank transactions. Federal officials also plan to work with provincial governors to lower so-called gross income taxes on goods, Mr. Dujovne said. 10% tax on high-end cars. The article points out that “Argentina ranked dead last out of 137 countries in a recent survey on tax-rate competitiveness by the World Economic Forum.” Macri’s administration is attempting to reverse decades of ruinous fiscal policies. In Spanish: Clarín has dozens of articles on the proposed tax reform. Argentine President’s Coalition Wins Midterm Elections.Mauricio Macri’s Let’s Change group garners broad backing in key provinces, easing his path to new tax cuts and other market-friendly policies. Mr. Macri’s top Senate candidate in Buenos Aires province, Esteban Bullrich, outpolled former president Cristina Kirchner by about 41% to 37%, hindering her hopes of regaining control over the Peronist political movement. Though Mrs. Kirchner won one of three Senate seats at play in the province, her failure to best Mr. Bullrich will likely embolden her Peronist rivals, many of whom support Mr. Macri and don’t want her to seek the presidency again. As I understand it, this means that, even when she’s not head of the Peronists, she gets immunity from prosecution as long as she is a Senator. Matthew Winkler writes, Investors Reward Argentina for Taming Inflation. Stocks? Up. Bond returns? Strong. The financial sector? Improving. Money managers have noticed. Since he was elected president almost two years ago, former Buenos Aires Mayor Mauricio Macri is delivering on his promise to reverse the runaway cost of living and peril of default. He ended currency, price and trade controls and plans to eliminate the energy subsidies of his predecessor, Cristina Fernandez de Kirchner, that ballooned the deficit and ushered in the boom-and-mostly-bust cycle that 44 million citizens equate with modern times. To be sure, the risk of Kirchner’s political comeback remains. Between June 24, when she announced her candidacy opposing the Macri government, and Aug. 13, when she faltered in the primaries, credit-default swaps, which measure the perception of creditworthiness, deteriorated 13 percent before improving when the votes were known. The yield on Argentina’s benchmark sovereign debt similarly climbed before returning to a level below its June 24 mark two days after the primary votes were disclosed, data compiled by Bloomberg show. The Argentine stock market, by contrast, showed none of the bond market’s anxiety over Kirchner, and the Argentina Merval Index of 22 companies continues to reach new highs this year. The peso also has stabilized with the receding Kirchner threat, and after the primaries had its biggest one-day gain since April, Bloomberg data show. Read the whole thing. Macri has his work cut out for him, but if he can “create a sustainable tax base that will inspire enough foreign direct investment”, in Winkler’s words, the country will be better poised for growth. Israel’s Prime Minister Benjamin Netanyahu is touring South America, with a first stop in Argentina. Netanyahu arrived Monday, marking the first visit to Latin America by an Israeli leader since the creation of the Israeli state in 1948. He is also scheduled to visit Colombia and Mexico before going to New York, where he will address the UN General Assembly on September 26. Netanyahu: Argentina has gone from hostility to friendship with Israel. Which LatAm countries are at the G-20? Three: Argentina, Brazil and Mexico. 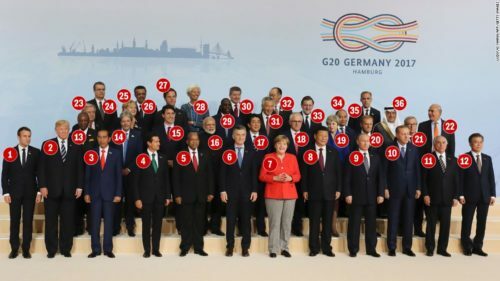 Argentina’s Mauricio Macri (#6), Mexico’s Enrique Peña Nieto (#4) and Brazil’s Michel Temer (#11) are in attendance. 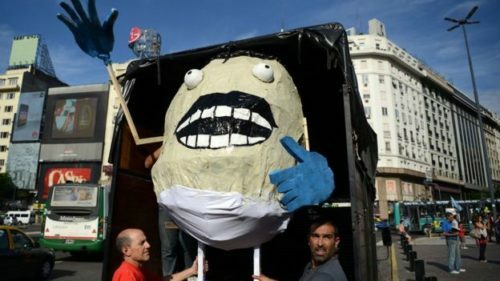 In intensifying walkouts and street rallies involving five national unions, teachers are asking for higher salary increases and blasting Mr. Macri for failing to jump-start the economy and control Argentina’s relentless inflation, which reached 40% last year. The government, aiming to cap inflation at 17% this year, has discouraged cash-strapped provincial governments, which set teacher salaries, from granting more generous raises. The deepening standoff underscores the difficulties facing Mr. Macri’s pro-business government as it seeks to unwind years of free-spending populist polices by his predecessor, President Cristina Kirchner, and secure the political and popular support needed ahead of legislative elections in October. Mr. Macri needs a convincing win to push forward with his reforms. The Journal reports that teachers in the Buenos Aires province make 43% of what teachers earn on average in other Organization for Economic Cooperation and Development countries.